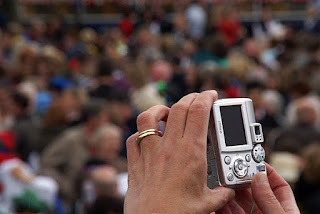 June 29th is... National Camera Day, Hug Holiday, International Mud Day, National Waffle Iron Day, Feast of Saints Peter and Paul, National Almond Buttercrunch Day, Drive Your Corvette To Work Day, National Food Truck Day, World Scleroderma Awareness Day. -- a day established to celebrate photography and the invention of the camera. Today most of us have a cameras in hand thanks to smart phones and tablets. That was far from the case in the past. The first cameras were so large and bulky, they required several people to operate. -- This gorgeous cornerstone volume celebrating the camera and the art of the photograph, created in collaboration with the George Eastman House, spans almost 200 years, from the first faint image ever caught to today's state-of-the-art digital equipment. The informative narrative by Todd Gustavson -- including insightful essays by Steve Sasson (inventor of the digital camera) and Alexis Gerard (visionary founder of Future Image Inc.) -- traces the camera's development, the lives of its inventors, and the artists behind the lens. -- Roy inherited his dad's way of greeting both friends and strangers alike with a hug. In his journey from small-town Texas boy to CEO of a nationally acclaimed advertising agency, he hugged heads of state and CEOs, waitresses and receptionists, the famous and the salt of the earth. And he used hugs to mend fences, to get over it and get on with it, and to spread a little good in the world.